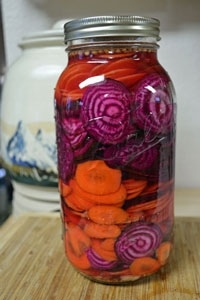 If you have never done fermentation then this is a good way to start - simple and easy. The recipe comes to us from Terroir Seeds. This recipe is a post we shared on our Facebook page that has been a tremendous hit. This is the type of conversation we have on Facebook that (usually) won't make it into the Newsletter! Join us for more great info. If using lid and ring, turn lid upside down and DON'T TIGHTEN, the fermentation will blow the lid off or blow the jar! Just lightly screw the ring on. Some folks will use a cheesecloth and the ring to keep everything out and avoid any overpressure. Let sit on counter. You will see bubbling (fermenting) after a few hours. Leave alone for 3 days, then put into fridge. Enjoy a tasty treat on your sandwiches, or as a snack! It really is this easy - it took us 15 minutes including cleanup.